Now the fun begins. 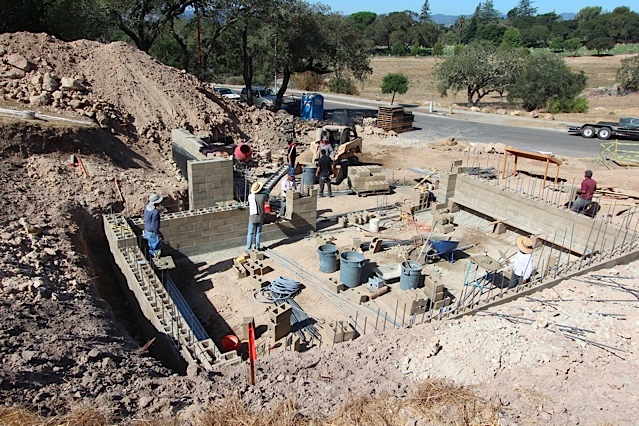 This is the first-ever house to be built using Watershed Blocks. They're a stabilized earth version of a standard cinder block, designed to integrate with masonry construction protocols, but with the thermal performance, low carbon footprint, and inherent natural beauty of all earth wall systems. We call them emu's for earth masonry units, in the same vein that concrete blocks are called cmu's. We started laying emu blocks the day after the foundation was poured. At first we started with just three men, taking care to get the first course of blocks level and the building squared. On day three we brought on two more masons and two helpers to improve efficiency. Our Watershed Blocks are designed to be the finished architectural surface, in the case of this building, both interior and exterior. We're building a double block wall, 16" thick. I didn't want furring, insulation, and sheetrock, which is the typical cmu building approach. Because both surfaces are final, the masons need to take more care laying the blocks and pointing the mortar joints. I'm going to monitor production carefully to get an accurate cost predictor for future projects, although there is a bit of a learning curve as we refine the methodology of block laying and grout joint work. I'm also realizing that by eliminating the furred interior wall we have to invest a lot more time in the electrical rough-in. More on this later. For now I wanted to show you the first few courses of the block work for the garage/kitchen wing. What shows clearly in the photos from above is the width of the double block wall and the cell space into which the concrete grout gets poured to complete the structural system. 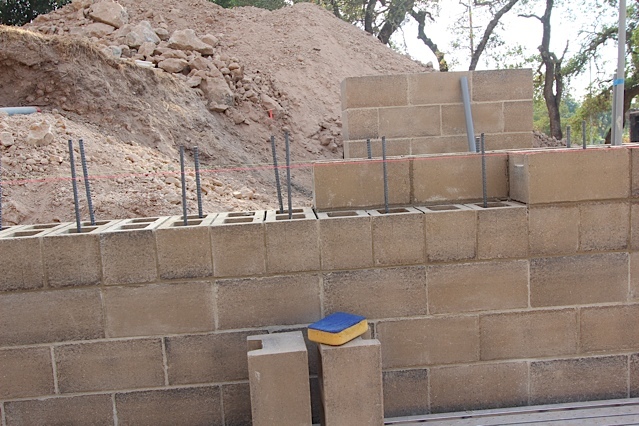 One of the reasons I'm confident that emu's will gain traction within the construction industry, where rammed earth and pise have struggled, is that the concrete core is a familiar design approach for structural engineers and a long-practiced method for masonry contractors. We have six or eight weeks of block work, between the two mass volumes of the house, so we'll have a lot of opportunities to discuss construction details, mechanical runs, efficiency, and structural consideration. Let me know if you have any questions.